Lookin forward to seeing my buddies and TimBob. Sorry everyone, looks like I am a late scratch for the event. Someone said earlier their schedule got too hectic, Vandygayle and I caught that same bug. Hopefully next year. I plan on coming out tomorrow. I also think I will come Sunday for awhile. I will get there around noon and need to leave around 330-400 tomorrow. It will be hard to say where we will be after lunch but most likely rafted up in a cove skiing or hydrating our bodies. You are welcome to swing by the house to see if we are around as well. There is a very good launch that is less than 1/4 mile from my house off Shoreline Drive (used to be the old circle drive access). just returned from driving 1240 miles this weekend and it was worth every turn of the wheel. Greg and Sue are just awesome hosts. Greg even ordered up some fantastic weather. We stayed out saturday till the sun went down. I took some pictures and posted them on FB but have no idea how to move them here. Larry..a little help? Tim should have some pictures also. Thanks to all who humored me by skiing with me. Thanks for all who let me drive their boats or let me pull them. Thanks to the Monahans for bringing my brother along so I could enjoy the weekend with him. Thanks mainly to Greg and Sue. What awesome hosts. If you are on the fence about attending this event...jump off and get yourself to Badin....you won't be sorry. Thanks for hosting another great event. I had a blast. Friday was 92 (F) and Sunny and Saturday and Sunday were both 87 (F) and Sunny. I do believe this was the best weather we have had yet for this event. It was great to see old friends and the chance to meet some new friends. . Here are photo of Larry Skiing behind my 2002 Sport Nautique. He was putting on a clinic. Having trouble posting photos. They are coming out 90 degrees off. I have tried to rotate them and re-post with no luck. But its kind of like the Olympics. Its burning in an undisclosed location and next fall, Donald will stand down on the dock and shoot a flaming arrow up into the firepit and reignite if for next years festivities. The discussion was brought up on Sunday morning as to whether or not to do the 10th annual SJRR in 2019. We'll have to post it up to see if there is interest in doing it or not. Big Thanks to Greg and Susan for putting up with us all for the weekend. It indeed was a great one as the weather was grand for 3 days but the food, company and boats assembled were grander! I did take a few photos but most of you know the routine. Those of you on FB have seen a few photos of the weekend. I'll get em up when I get a chance. 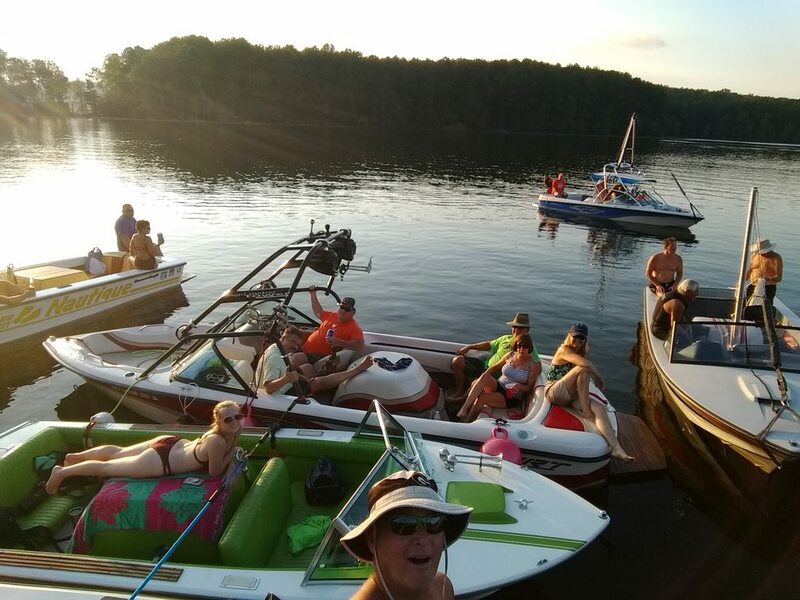 Even though the ski season isn't over; the gatherings of CCFans have for 2018 and spring won't get here soon enough so we can get together and have a blast on the water again with the CCFan Family. Of course, always a good time and many thanks to our hosts and to all attendees for the great company. 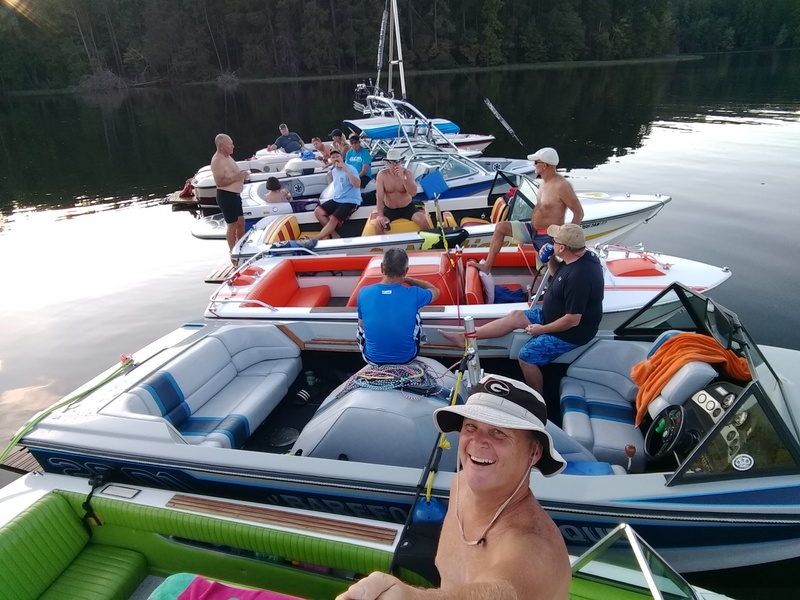 Due to other commitments my time was limited, and I was only there saturday, plus, again, due to time constraints, left my boat home, and unfortunately my ski also, figuring I would likely be focused on footing. Despite the short visit, I did pack a lot in. Early footing outing with Gregs 206 and Greg, Justin, his friend Sue and Scott and John in Scotts BFN "ferry". A few bacerds attempts that didnt go great, then doubles runs with John and Scott. Always a good time. Headed back to the dock. Then caught a ride with Donald and Justin and Sue again for a slalom run on Gregs ski. Lunch time, then back out on the lake for some rafting. Slalom run (on TimBobs wrong footed Radar) behind David's awesome Tique, then toward the end of the day some more doubles runs with Scott and John and some solid bacerds runs behind Greg's BFN. All in all, a pretty full day. I think that all added up to about 11 different runs, and minus a lunch break out on the water from about 9 to 7. Morfoot, I took these when I first met up Friday afternoon. Thought it was a pretty cool shot when we were in a line running out onto the lake. Maybe next year my schedule will allow me more time out there. I did what I could this year. In Tim's second pic above, whose blue BFN is that? Doesnt look familiar, wasnt there saturday. The ladies plus Morfoot . Also, father daughter apple pie shot ski run. A family that drinks apple pie together, stays together. Nautique John (Marrow) came only Friday with that beautiful Blue BFN that belongs to Kurtis. They all work with Reid P.
A couple video clips from Saturday morning. A couple bacerds fly-bys by JBear and a doubles run with Scott and John. I think John hit about 60 mph on that whip. Had a great time. Appreciate everyone letting me jump into a boat and hang out. Gregg and Sue are always awesome hosts! Hope everyone had an uneventful trip home. Next year I’ll have to be there when the boat pics are taken to get mine in the pics!